Whilst Marseille itself offers a wealth of attractions, it is worth venturing further afield to discover other attractions that the Provençe region has to offer. A short journey from Marseille brings visitors to a number of noteworthy attractions. Close to the city you will discover a number of coastal resorts, traditional towns and villages, and larger historic cities. A 32-km / 20-mile journey along the coast from Marseille takes you along some beautiful coastline to the nearby pretty fishing village of Cassis. Its pure white cliffs and traditional charm make it particularly appealing to tourists. Boat trips to the Calanques - long, narrow inlets which can be found along the coast - are a popular trip out. For those who prefer to walk, there are also a number of well-marked paths, leading to some stunning secluded bays and beaches. 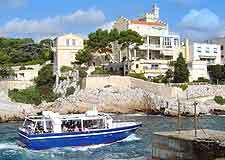 Cassis is an ideal day out for those seeking to sample some of the famous local Mediterranean cuisine and wine. The village is also popular with windsurfers and watersports enthusiasts. 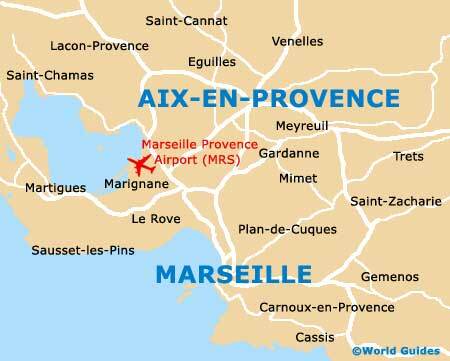 The city of Aix-en-Provence is about 25 km / 16 miles from Marseille and is best known for its quiet charm and elegance. 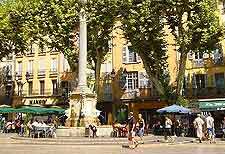 Chief among Aix's attractions are its tree-lined boulevards, public squares and fountains, and fine old mansions. Of notable interest is the Circuit de Cézanne, a marked walking trail which celebrates the life and work of the city's most famous artist. A number of good museums can also be found there. 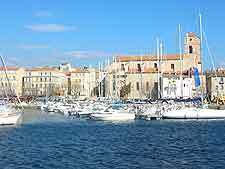 The little port of La Ciotat, about 32 km / 20 miles from Marseille, is acknowledged as the birthplace of cinema. Movie buffs can visit the town's train station where, in 1895, the Lumière brothers made the world's first ever film. Another attraction is the Eden Cinema, reputed to be the oldest cinema in the world. The town also boasts a number of excellent beaches, a lively waterfront and boat trips to the nearby tiny island of Ile Verte, making La Ciotat an appealing day trip destination for tourists staying in Marseille. 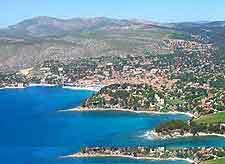 Situated inland, just 18 km / 11 miles from Marseille and in the direction of Cassis, is the nearby small town of Aubagne. Today, it is home to many small pottery santon workshops and makes claims to being the home of these tiny Provençal figurines. The town is also notable as the birthplace of the famous writer and filmmaker, Marcel Pagnol. Arles lies about 80 km / 50 miles west of Marseille. 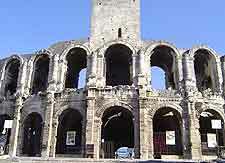 Home to the famous Roman arena, Les Arènes, Arles has numerous tourist attractions, landmarks and monuments dating back to the Roman and Medieval eras. Van Gogh also lived and painted many of his masterpieces here. Today, Arles is a traditional French small market town with a thriving Saturday market. During the Easter holiday, the town stages bull-fighting festivals and special events, attracting many visitors to the town.